Mashed Potatoes (with Diastatic Malt powder). This was a bit of a roll of the dice, as I have never made any of these thing before...sure I've mashed a tater in my day, but not using Diastatic Malt powder (more on that later). 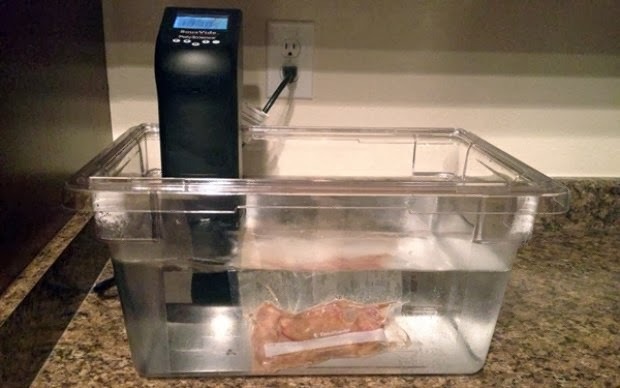 My new favorite cooking gadget is my Sous Vide water circulator. The recipe for the ribs is pretty simple, buy short ribs, double seal in vacuum bags, setup Sous Vide at 144 degrees, and let them cook for 3 days. Not very complex you say? Hey I had to add water to the thing several times over the two days! Cooking for such a long period of time at a low temperature allows the meat to retain its moisture, but with the low temperature a long cooking time is needed for the meat to become deliciously tender. OK, I had the ribs a cookin' in ye good olde boil in a bag, but a short rib really needs a great sauce to complement it. I again turned to my new friends at Modernist Cuisine for a red wine glaze recommended to go with the 72 hour Short Ribs. Imagine all those flavors condensed down to 1/3 cup... mmm!!! The recipe involves browning the ground beef, cooking down the veggies, and throwing it all in a pressure cooker for a couple of hours. One helpful tip if you try this recipe, start the sauce a day before you need it. After you cook everything in the pressure cooker and strain out the solids, put the liquid in a bowl in the refrigerator overnight. The fats will congeal and rise to the top - discard this part and use only the dark brown aspic like stuff at the bottom of the bowl. This will save you from a ton of skimming off fat when you do the final boil down of the glaze. Also, don't skip the final part of the recipe that calls for dark soy sauce and balsamic vinegar to taste, the glaze is delicious without - but these extra flavors really make the taste pop! To make the whole birthday dinner a comfort food experience, you've got to go with the classic companion to short ribs with some mashed potatoes. For my birthday dinner, my wife made me the potato puree from Joël Robuchon. That recipe calls for 1 lb of butter and a bit of milk for every two pounds of potatoes. It was definitely decadent, but the potato flavor was really lost to me... not that there's anything wrong with a butter puree, but I really like to actually taste the potatoes - that's just how I roll! Yet again I turned to the folks from Modernist Cuisine to help out with a potato recipe. Their recommendation was very intriguing indeed. Uber-creamy potatoes with... drum roll please... NO BUTTER OR MILK OR CREAM... wow. The secret is in something called Diastatic Malt Powder which has an enzyme that breaks down the starch in the potato so that it is smaller, and therefore a creamier potato... or at least that's the idea. All I did was peel, cube, and boil some Yukon Gold potatoes (boiled with a good amount salt and a bit less sugar) - then drained, added the Diastatic Malt Powder, and put the mix through a potato ricer. The potatoes then go into a Ziplock bag, and into very hot tap water (about 125 degrees) for 1/2 hour... that's it! A special occasion like the wife's b-day needs a very special wine. A good excuse to break out a 2008 Darioush Darius II that I've had aging in the wine fridge for a few years. This wine could definitely age for many more years, so I opened it up early on Saturday morning to give it a good 10 hours of decanter time before dinner. Hey... if the ribs get 72 hours of attention, the wine deserves at least 10! The aromas were already fairly powerful when I first decanted it... a very good sign. Lots of blackberry, and a note of wood - but not really oaky, more like cedar. I couldn't wait to see what 10 hours in the open air would bring out! As dinner time neared, I had also decided to make a before dinner cocktail, or quoting the movie Easy-A "I hope you don't mind, but we had a few pre-cocktail party cocktails... like before the cocktail party... with cocktails." When we had the Bocuse d'Or menu at Next Restaurant in Chicago, they kicked off the meal with the New Orlean's classic Sazerac. It was my first and it was awesome. A pretty simple recipe, with a sugar cube, Peychaud's Bitters, Rye or Bourbon (I used Buffalo Trace Bourbon), some Absinthe just to rinse in the glass mostly for the aroma, and a twist of lemon peel. Very delish if I do say so myself. I will definitely be making these again... good thing otherwise what would I use up a whole box of sugar cubes??? The Ribs. Wow! Fall off the bone tender! When cooking Sous Vide it is possible to cook meat too long - where it gets too tenderized and is an unpleasant texture to eat. Not the case here after 72 hours - tender but still had a good braised rib texture. I also liked the color was not dark like a well done braised rib - still some pink to it. I would look for a bit more lean rib next time, I got these at Whole Foods and figured they would be the best, but I think Whole Foods is working on providing more affordable products (trying to shake the "Whole Paycheck" nickname) and these ribs may have been one of those products. I know ribs have a lot of fat and therefore flavor - but a bit more lean would have been even better. The Glaze. This glaze was not easy to make, several hours (of actually cooking - not boil in a bag! ), but the taste was absolutely amazing. We did not need any more than the 1/3 cup or so that the recipe ended up making - the flavor is so intense, but so complex...wow. An excellent accompaniment to the ribs - if they're going to cook for 72 hours, you'll have time to make this sauce. The Potatoes. I didn't know what to expect with these potatoes, but I was very impressed with the results. I ended up only putting a small pat of butter on top when served - no other dairy, and no salt since the potatoes cooked in a nicely salty water. The texture was incredible - super creamy, and no surprise - total potato taste. The Wine. With all this great food, I'm glad I picked a wine that was big enough, and good enough to stand up and not be overshadowed. I probably should have opened it for a 24 hour decant, but even with 10 hours it had great aromas of blackberry, licorice, and cedar. The wine had a nice amount of tannins, and a very long finish which matched nicely to the long finish of the intensely flavored glaze. I wish I had a Châteauneuf-du-Pape to try with the ribs and glaze, because that or another Rhone wine is what I usually think of for this type of dish. But this wine was excellent. Overall a home run in my opinion, and my #1 customer and wife seemed to agree. Whew! Now I need to start planning for next years Wino4Life Wife birthday dinner... any suggestions?? ?